2.Approach I : From your admin dashboard. 4.How to setup front page as shown in the demo? 5.How to manage Site Identity Section ? 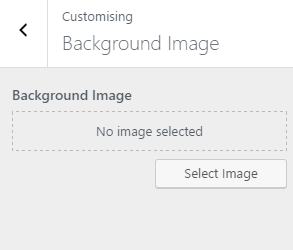 7.How to manage Background Image? 8.How to manage Menu Options ? 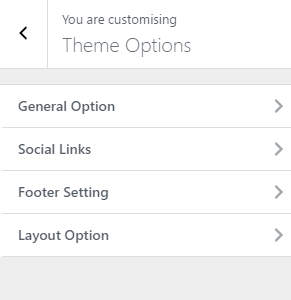 9.How to manage Theme Options ? 10.How to manage General Options ? 11.How to manage Social Links? 12.How to manage Footer Settings? 13.How to manage Layout Option ? 14.How to manage Background Image? 15.How to manage Home Section Options ? 16.How to manage Slider Setting? 17.How to manage About Section Setting? 18.How to manage Service Section Setting? 19.How to manage Team Section Setting? 20.How to manage Work Section Setting? 21.How to manage Testimonial Section Setting? 22.How to manage Blog Section Setting? 23.How to manage Client Section Setting? 24.How to manage Pricing Table Setting? 25.How to manage Contact Section Setting? 26.How to manage Typography Options ? 27.How to manage Color Setting? 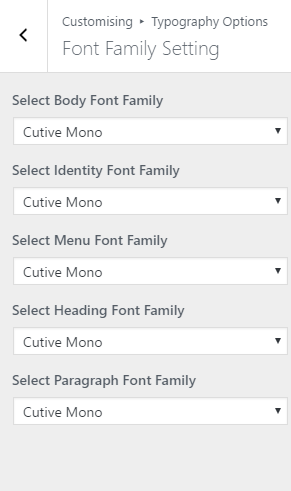 28.How to manage Font Family Setting? 31.How to manage Static Front Page ? 32.How to manage Additional CSS? 33.How to manage Reset all setting? Click Browse Locate Business-Page-Plus.zip Theme in your computer. Select Business-Page-Plus.zip and click Install Now. Unzip Business-Page-Plus.zip to your Desktop. Using an FTP client to access your host web server, go to /wp-content/themes/ and upload your new copy of Business Page Plus Theme. 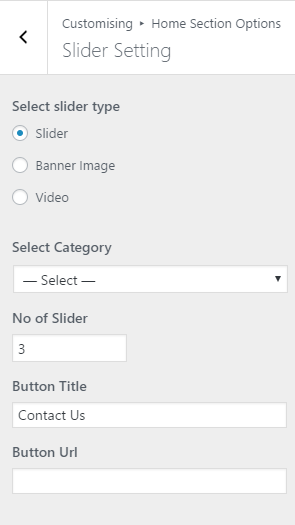 Slider Section: This section is setup from Admin Panel / Appearance / Customize / Home Section Options / Slider Settings Refer below How to manage Slider Settings ?for more details. Refer below How to manage Site Title, Logo, Tagline and Site Icon?and How to manage Menus? for more detail. 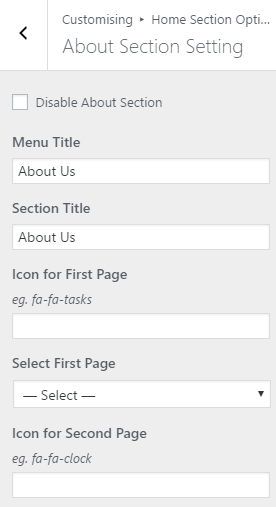 About Us Section : This section is setup from Admin Panel / Appearance / Customize / About Section Settings . 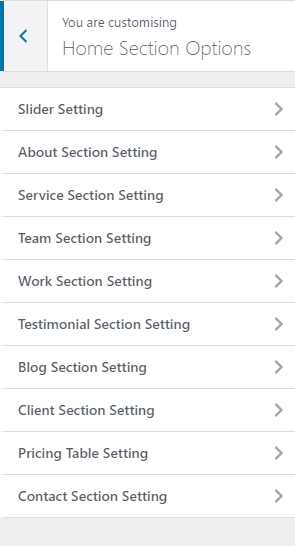 Refer below How to manage About Section Settings ?for more details. What We Do Section : This section is setup from Admin Panel / Appearance / Customize / Service Section Settings . Refer below How to manage Service Section Settings ?for more details. Counter Section : This section is setup from widget.So you need to go to Admin Panel / Appearance / Customize / Widget / Counter Widgets area and add Business Page : Counter Up . Refer below How to manage theme available widgets? for more detail. 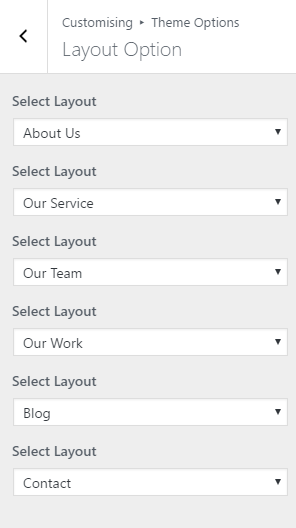 Our Team Section : This section is setup from Admin Panel / Appearance / Customize / Team Section Settings . Refer below How to manage Team Section Settings ?for more details. 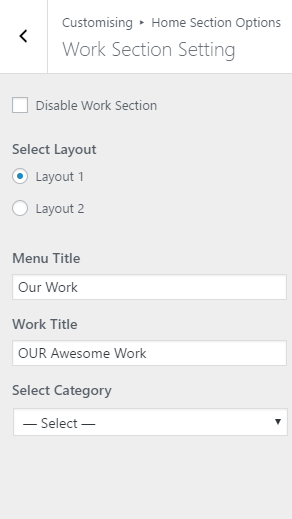 Our Awesome Work Section : This section is setup from Admin Panel / Appearance / Customize / Work Section Settings . Refer below How to manage Work Section Settings ?for more details. What People Are Saying Section : This section is setup from Admin Panel / Appearance / Customize / Testimonial Section Settings . Refer below How to manage Testimonial Section Settings ?for more details. 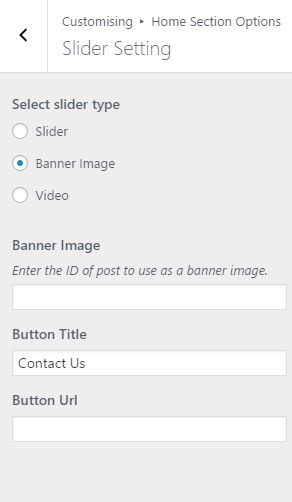 From Blogs Section : This section is setup from Admin Panel / Appearance / Customize / Blog Section Settings . Refer below How to manage Blog Section Settings ?for more details. Client Section : This section is setup from Admin Panel / Appearance / Customize / Client Section Settings . Refer below How to manage client Section Settings ?for more details. Choose Your Best Plan Section : This section is setup from Admin Panel / Appearance / Customize / Pricing Table Settings . Refer below How to manage Pricing Table Settings ?for more details. Social Icon Section Section : This section is enabled from Admin Panel / Appearance / Customize / Theme Options / Footer Setting . Refer below How to manage Footer Settings ?for more details. Social links are entered from Admin Panel / Appearance / Customize / Theme Options / Social Links. Refer below How to manage Social Links ?for more details. Footer Copyright Section: To setup this section you need to go to Admin Panel / Appearance / Customize / Theme Options / Footer Options. Refer below How to manage Footer Options? for more detail. 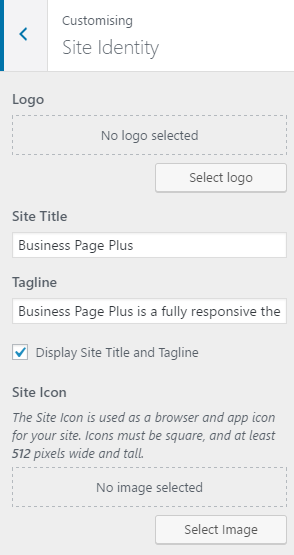 Display Site Title and Tagline: It allow to enable and disable the Site Title and Tagline. 1. From Customize section, go to Colours Options..
2. 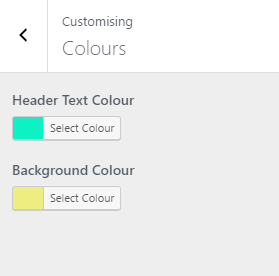 From Colours Options, you will see Header Text Colour & Background Colour Options sections. 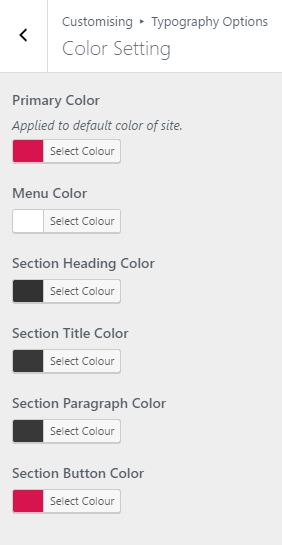 Header Text Colour: Select the color available in the options. Background Colour: Select the color available in the options. 1. 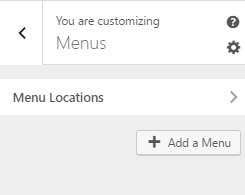 From Customize section, go to Menu Options . 2. 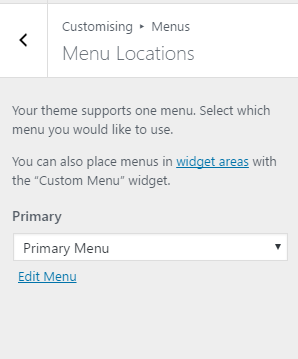 From Menu Options section, go to Top Menu Settings. 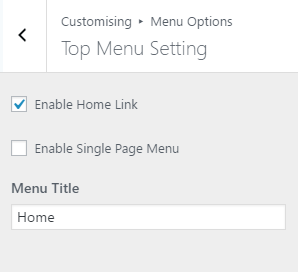 Enable Home Link: This options will enable the home link at the menus section . Enable Single Page Menu: Enabling this will allow the single page menu and upon disabling will display the menu that is assigned to the primary menu Location in menu bar . Menu Title: It allow you to change the menu title . Enable Posted Date: This option will enable the posted date . 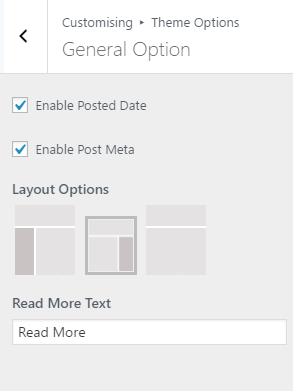 Enable Post Meta: This option will enable the post meta . Layout Options: This option will enable you to chose the layout for the pages . There are three available options . Read More Text: This option will enable you to change the text of Read more button in blog page . 2. 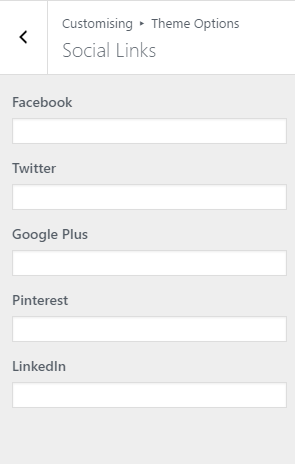 From Theme Options, you will see Social Links sections. 2. From Theme Options, you will see Footer Settings sections. 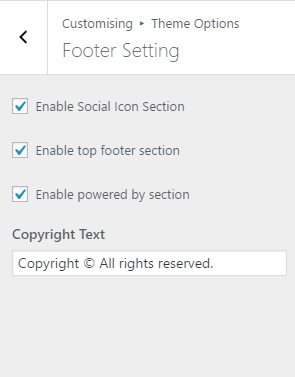 Enable Social Icon Section: This option will enable the social icon in the footer sections. 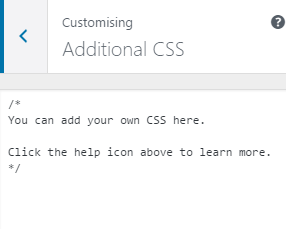 Enable top footer section: This option will enable the top footer section . Enable powered by section: This options will enable the powered by section. Copyright Text: This field will enable you to change the Copyright text . 2. From Theme Options, you will see Layout Settings sections. 3. In Layout Settings you will see the fields from where you will be able to chose the sections as per the order you want . You can chose placement of sections as your wish from here. 1. From Customize section, go to Home Section Options. 1. From Customize section, go to Home Sections Options. 2. From Home Sections Options, you will see Slider Settings . Select Category : This option allow you to select the category to display in the slider . No of Slider : This option allow you to set the no of slider . Button Title : This option allow you to edit the button title . Banner Image : Enter the ID of post to use as a banner image. Add Video : This option allow you to add the video file. Disable Audio : This option allow you to disable the audio. Video Title :This option allow you to edit the video title . Button Title :This option allow you to edit the button title . Button URL :This option allow you to set the URL to link the button. 2. From Home Sections Options, you will see About Section Settings . Disable About Section : This option allow to enable/disable the about section. Menu Title : This option allow to change the menu title if single page menu is selected from menu option. Section Title : This option allow to change the section title. Icon for First Page : This options allow to enter the icon . 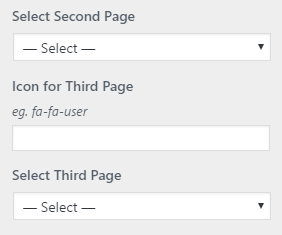 Select First Page : This option to select the page to display in this sections . 2. From Home Sections Options, you will see Service Section Settings . Disable Service Section : This option allow to enable/disable the service section. Menu Title : This option allow you to change the menu title if single page menu is selected from menu option. Section Title :This option allow you to change the section title. 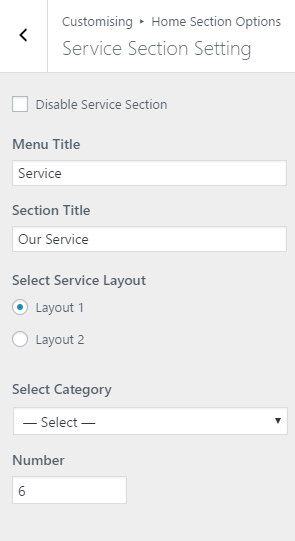 Select Service Layout :This option allow you to chose the layout for service section . Select Category :This option allow you to select the category . Number :This option allow you to to set the number to limit the no of post . 2. From Home Sections Options, you will see Team Section Settings . 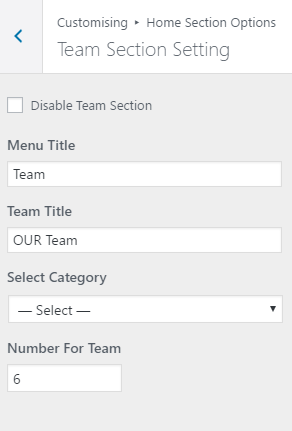 Disable Service Section : This option allow to enable/disable the team section. Team Title : This option allow you to change the section title. Number For Team :This option allow you to to set the number to limit the no of post. 2. From Home Sections Options, you will see Work Section Settings . Disable Work Section : This option allow to enable/disable the work section. Select Layout : This option allow you to chose the layout for the work section . Work Title : This option allow you to change the section title. 2. From Home Sections Options, you will see Testimonial Section Settings . Disable Testimonial Section : This option allow to enable/disable the testimonial section. Testimonial Title : This option allow you to change the section title. Number For Testimonial : This option allow you to set the number to limit the no. of post . 2. From Home Sections Options, you will see Blog Section Settings . 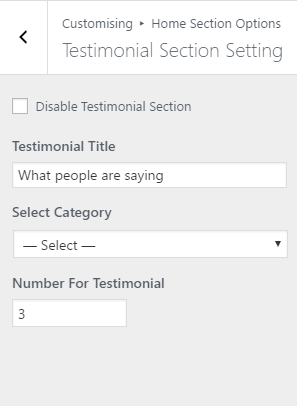 Disable Blog Section : This option allow to enable/disable the testimonial section. 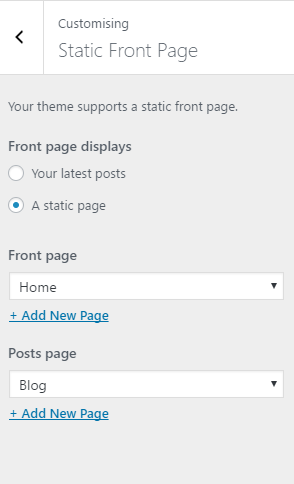 Blog Title : This option allow you to change the section title. 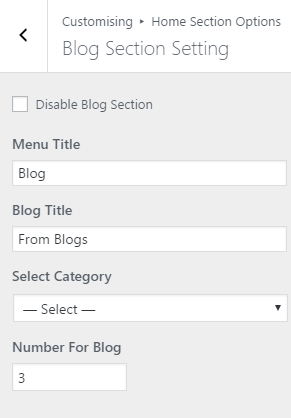 Number For Blog : This option allow you to set the number to limit the no. of post . 2. From Home Sections Options, you will see Client Section Settings . 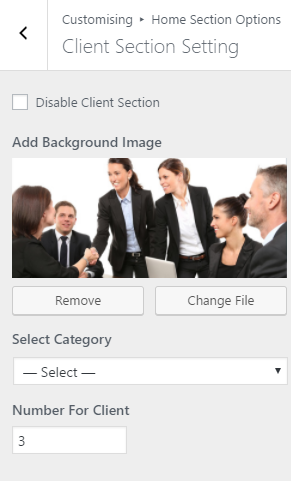 Disable Client Section : This option allow to enable/disable the client section. Add Background Image : This option allow you to add the background image for this section. Number For Client : This option allow you to set the number to limit the no. of post . 2. 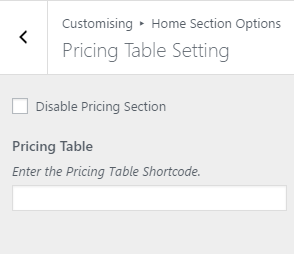 From Home Sections Options, you will see Pricing Table Settings . Disable Pricing Section : This option allow to enable/disable the pricing section. Pricing Table : Enter the Pricing Table Shortcode. 2. From Home Sections Options, you will see Contact Section Settings . Disable Contact Section : This option allow to enable/disable the contact section. 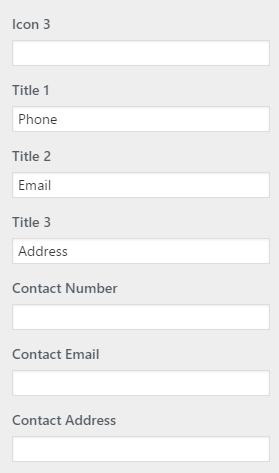 Contact Title : This option allow you to change the section title. 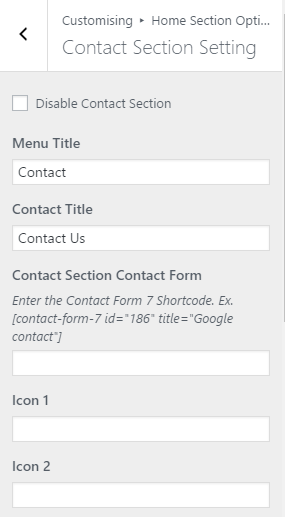 Contact Section Contact Form :Enter the Contact Form 7 Shortcode. Icon : Enter the font awesome icon class here. Title : Enter the titles. Contact Number : Enter the contact number. Contact Email : Enter the contact email. Contact Address :Enter the contact address . 2. From Typography Options, you will see Color Settings. Color Settings : In this section you will see different color options. Now change the color as per your need. 2. 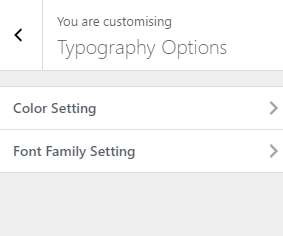 From Typography Options, you will see Font Family Settings . Font Family Settings : In this section you will see different font options. Now change the fonts as per your need. How to change Menu Locations? Select the menu for Primary Menu. Primary menu appears as a main menu in header section. Business Page : Counter Up: You will find options and settings in this widget. Now setup the widget according to your need. See the below image. How to manage Additional CSS? 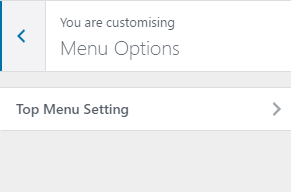 1.From Customize section, go to Reset all Settings. 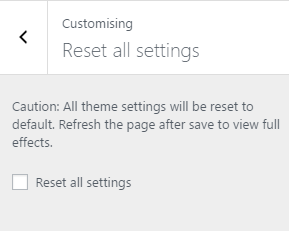 Reset all settings: This option reset all the theme settings and resets all the color settings to the default values along with custom header and background will be reset to default.Note: Refresh the page after save to view full effects. You need to refresh the page to see the changes. Using an FTP client to access your host web server, go to /wp-content/themes/ and upload your new copy of Business Page Plus Theme which shall replace the old files.